Your Best Chance to Grab a Brand New KXD Smartphone on JUMIA! Have you been counting down the days for Black Friday 2018? There is even better news! KXD Mobile will offer its BIGGEST DISCOUNT EVER on its newly launched smartphones — a whopping 44% and 30% off for the KXD W50 and KXD W55. The W50 and W55 are the newly released entry-level smartphones from KXD Mobile, a smartphone company headquartered in Shenzhen, China, and has more than ten years of expertise in the phone industry. The W50 features a vibrant 5-inch 854×480 display, quad-core CPU with 1GB RAM and 8GB ROM, 8MP rear camera and 5MP front camera, removable 2100mAh battery, and dual SIM dual standby feature. The W55, on the other hand, has a bigger 5.5-inch 960×540 display and a bigger removable 2500mAh battery, and the rest specs are same as the W50. The W50 and W55 all come with Android 6.0 and offers four stunning colors: red, blue, gold and black. Every part of the W50 and W55 is carefully designed to make it a joy to use and be your smart companion. The MSRP for the W50 and W55 is 499Dhs and 699Dhs respectively, which is already super competitive. 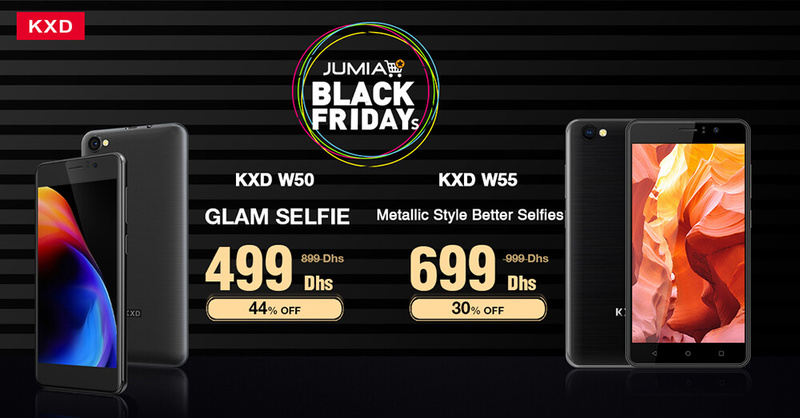 Now with a 44% OFF and 30% OFF for the W50 and W55, it is really hard not to be tempted by KXD’s Black Friday Offers on JUMIA!